Using a drill (properly, at that) is a very important life-long skill that should be learned from a young age. So is finishing a project. Last week, the kids were able to share in this fun and rather easy project and learn from my procrastination. Too bad the resulting product is really only useful to one of them (unless the Boy decides that he’d like to wear earrings too). This was a project that I had hoped to finish as a gift to the Girl this past Christmas, because her earrings had been slowly invading too much space on my own wall-mounted earring-holder. So I looked at my earring holder, and some that were already designed out there, and set out to design a holder that would be functional, easy to build, fun to use, and which wouldn’t require expensive materials (in fact, I wanted to use not only inexpensive, but upcycled materials as much as possible). But time got away from me around Christmas, and I convinced myself that the Girl had received too many gifts anyway. As days went by, the materials sat there and mocked me, and the Little-Girl-earrings were slowly overtaking the Sophisticated-Adult-earrings. So now was the time. 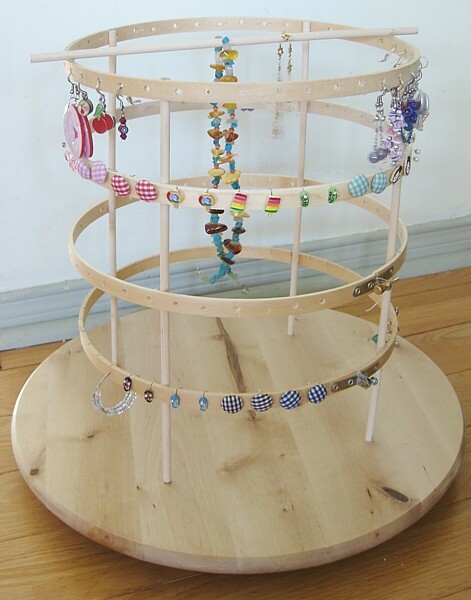 This is my own invention: a revolving earring storage unit on a Lazy Susan base, with holes to easily hold fishhook earrings, and notches to hold fishhook and stud earrings. Below is the list of supplies and materials, and a brief description of how I built this. I know, I know—it would have been easier if I had stopped at each step to take photos, but sometimes you’re just too into a project (or the hot glue is threatening to drip all over your fingers and/or project) to stop and take pictures. It was great fun to do this, both kids had such pleasure drilling holes, and even The Beloved Husband commented admiringly that this was my best designed and executed project yet. > 5 wooden dowels, measuring 30 cm long x 1 cm thick (12″ x 3/4″): $1 for package of 8 at dollar store (slightly more if purchased at hardware store). We had some left over from a previous project, making suction-cup arrows for the Boy’s bow and arrows, so the cost for this was nominal. 1) Plug in glue gun and keep in a safe place away from children. Disassemble embroidery hoops. 2) While an adult holds the measuring tape along the outside of each hoop, a child can pencil in marks about 2 cm (1″) apart on each hoop, all the way around (try to keep it centred vertically). This will be where you will drill the holes or cut the notches that will hold the earrings. 3) Making the holes to hold earrings: While an adult holds each hoop steadily, the child can carefully drill holes where marked, on two of the hoops only. This should be fairly easy to do, because the hoop wood is thin. Use the drill’s lowest speed. 4) Making the notches to hold earrings: Adult only should use a hacksaw or serrated knife to saw little notches about 3 mm down the hoop on the remaining two hoops, where pencil-marked. 5) Using sandpaper or emery board/nail file, sand both inside and outside of hoops, to get rid of minor wooden splinters. 6) Stack all hoops one atop the other, and mark four lines on the inside of each hoop, two sets across from each other (think of these as your North-South-East-West points). These will be where you will glue the dowels for support. 7) On each dowel, pencil in three marks approximately 15 cm (6″) apart, starting at one end. These will be where the hoops will be glued. 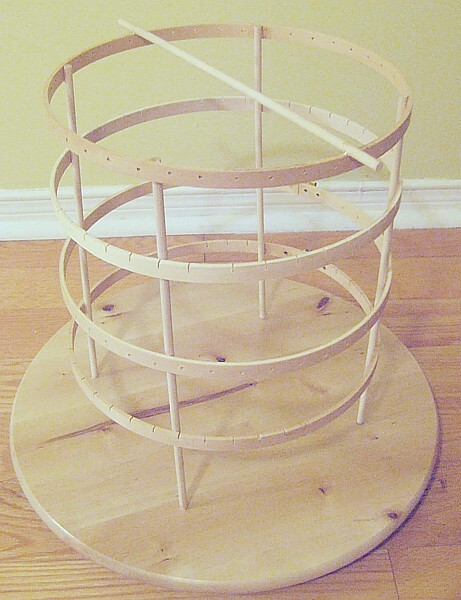 Continue until all four hoops have been glued onto all four dowels at the marked spots. 10) Wait a minute until the hot glue has solidified on the last dowel, and place the entire structure onto your lazy Susan. Place where you’d like it, and using a pencil, trace circles around the base of each dowel to mark where they will be attached. 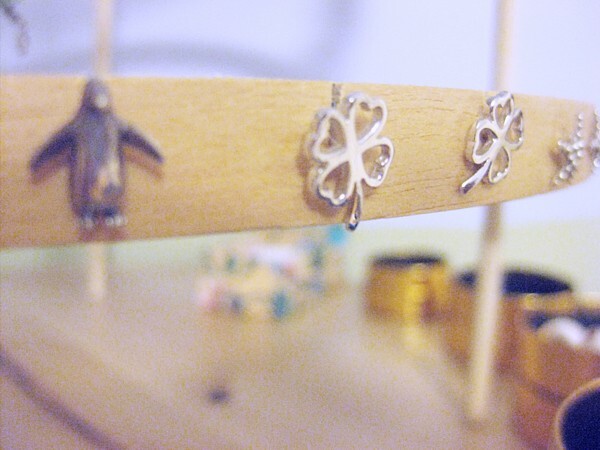 12) Optional: Glue the fifth dowel across the top of the earring holder, for necklaces and bracelets. You may want to use your handsaw or knife to cut notches into this, to prevent sliding of the necklaces. Et voilà—you now have a revolving earring holder for under $15 and an hour of work. 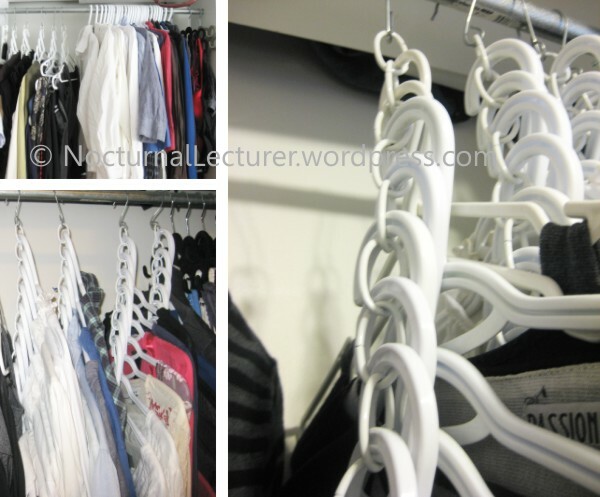 Hang necklaces and bracelets from the horizontal bar. With all that extra space at the base of the lazy Susan, we also used poster putty (like Fun-Tak) to position some little paper jewellery boxes to hold extra earring backs, rings, etc.. Thinking of doing this project yourself? Snap a photo and show us! A few years ago, one of my friends who was cloth-diapering part-time and concerned about the phosphates (not to mention the cost) of commercially-made laundry detergent, asked me how I made my own laundry detergent. I always said that I’d write it down for her, but kept forgetting to do so, and time went on even as my recipe was being tweaked. Of course, I certainly didn’t invent it, and merely modified other recipes that I’ve found on-line over the years. But now what I have is a lovely detergent that works well, and has a scent that I can custom make to our family’s liking. Although many laundry detergents nowadays are phosphate-free, there are still great reasons for making your own detergent. First off, the savings (see below) are significant—2.5¢ per load compared to 10¢-30¢ per load (depending on the brand). Second, making your own detergent means that you can control the amount (if any at all) of scent that go into your clothes. That’s always been one of the things that bothers me about laundry detergent—the strong, cloying smell on your clothes (not to mention the fact that you smell like everyone else who uses that detergent). Experiment with a few different essential oils to get the natural scent that you’d like in your detergent. 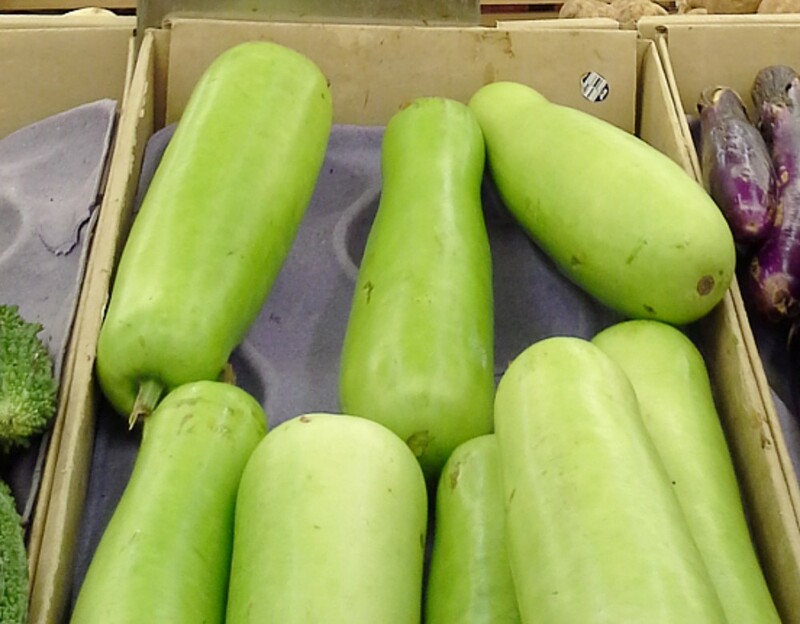 We prefer citrus scents. Third, believe it or not, it’s easy and fun. It really doesn’t take that much time and effort, and the kids and I love running our fingers through the gel-like texture. I recently discovered this recipe for laundry detergent on David Suzuki’s site. If homemade laundry detergent is good enough for Dr. Suzuki, it should be good enough for the rest of us. Although his recipe differs slightly from my own, his page has an easy-to-understand how-to video. Below are my recipes for both liquid and solid versions, along with an estimate on how much it costs per load. (I edited this to take out mentions of Oxi-Clean, since I’ve discovered that that stuff’s not so great for the environment, and is essentially just an expensive version of hydrogen peroxide + washing soda). Your kids will love running their hands through this! A) Boil water in a large stock pot. While water is boiling, grate soap. 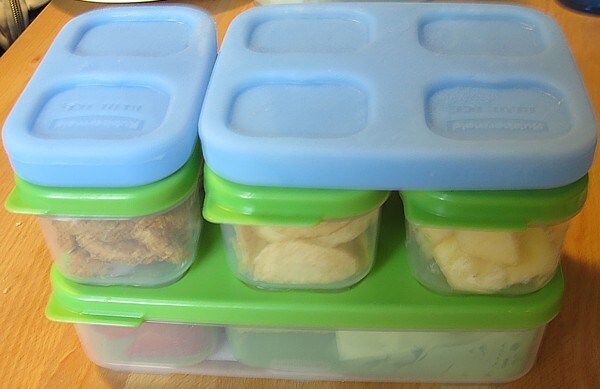 Tip: Soap is easier to grate if you’ve frozen it for a bit. You could try to grate soap in a food processor, but some soaps (like Linda’s Laundry Soap) grate well, while others (like Ivory) end up clumping and forming little balls that stick together. 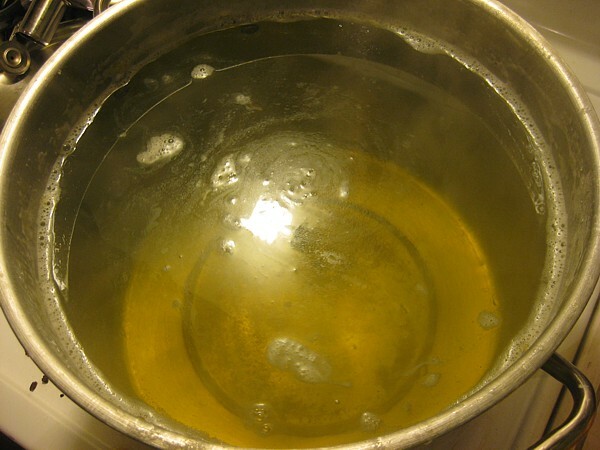 B) Pour soap into boiling water and stir to melt. C) Combine these powdered ingredients into a large container (I use washed buckets that held kitty litter or snow-clearing salt). 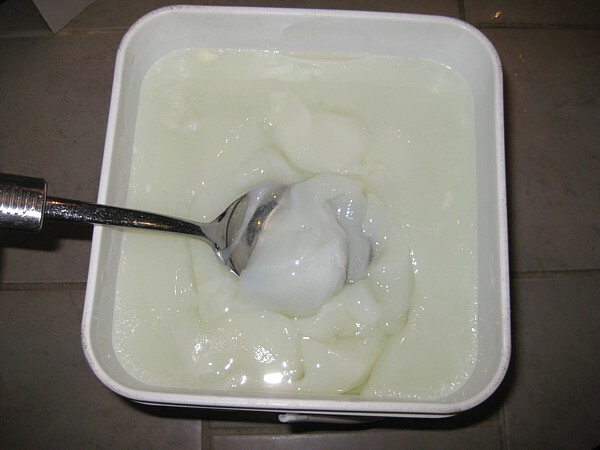 D) Pour hot soap mixture into powdered ingredients, and stir to dissolve. E) Pour 14 litres of water into the above mixture, and stir. Can be used immediately, or let cool and set into a gel (several hours). Use 125 mL (1/2 cup) per load. I tend to use 250 mL (1 cup) for heavier loads. Works perfectly in our HE washer. 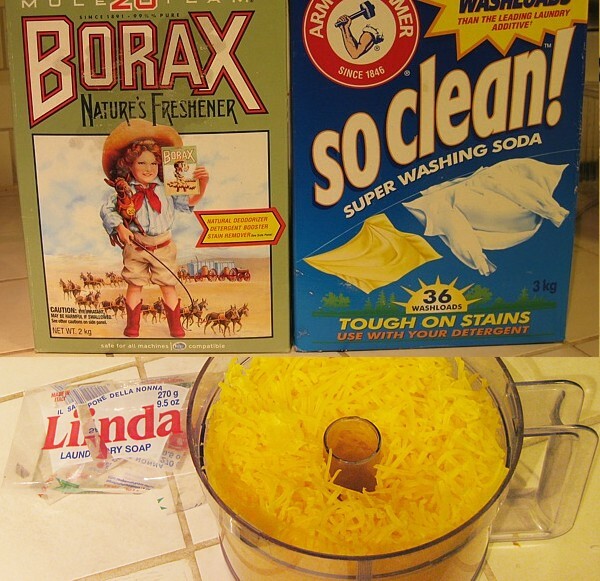 Measure the same amounts of soap, borax, and washing soda as in above recipe. Mix these ingredients together dry, without water. Okay, this project isn’t so much a “We made it!” project as it is “We embellished it!”. In our household, we’ve lost two kids’ Sigg bottles so far, with the latest being the Boy’s. So I bought him a plain stainless steel bottle as a replacement, figuring no great loss if this went missing. But it was so plain that I didn’t want him feeling like the odd man out when the rest of us have such lovely bottles, so I suggested this easy project. The Boy loves the result so much (even wanting me to glue extra rhinestones on to it), and is now so eager to bring his bottle everywhere that I bet he’ll take extra special care not to lose this one. I liked the project so much that I continued with one of my own travel mugs. If you try this project, just remember that you’ll have to handwash your creations and never put them in the dishwasher. My mind seems to be taken up with all things to do with laundry this past week. The old saying goes, “The cobbler’s children have no shoes.” Well, I’d been wanting to make this for a long time, but have been putting it off. 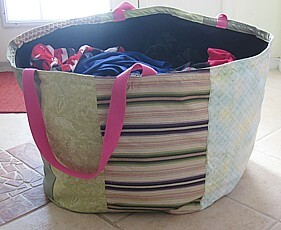 We haven’t used an unwieldy laundry basket for years; good heavy-duty laundry bags are just easier to carry from one room to another, and in a pinch, you can throw it down a flight of stairs in a fit of frustration, without any damage to anything. We’ve been very happy with a sturdy garden/leaf bag that I’d found in a hardware store a few years ago. Unfortunately, we only have one that is the right size (the other ones, twice as large, serve as giant receptacles for the kids’ outdoor toys and various stored items in the basement), so we’ve just been emptying it and using it for several loads at a time, which is a pain. So, inspired by this very purple person project and using the current laundry bag as a template, I set out to use some scraps from my ginormous stash of fabric. From my stash, I chose fabrics in a green colour theme, and for the handles, I used funky pink cotton webbing from a leftover project. The problem with me when it comes to personal projects, however, is that I’m lazy and like to cut corners. Measure twice, cut once? Pshaw! Interfacing? Who needs it? So this project, which in my estimation should have taken about an hour, actually spanned about three days, in-between various other domestic and everyday tasks, and yes, a trip to the fabric store to actually buy, sigh, interfacing. But it’s done now, and is serving its purpose well; it holds a lot of clean, unfolded laundry for many weeks days at a time. It even holds one medium-sized kid for slippery rides on the hardwood floor. Sure, I could have bought some cheap-o bag like the Frakta from IKEA, and it might have served the same purpose for a while before ripping apart. But that wouldn’t have been any fun, and the kids wouldn’t have had a chance to look at and feel all the nice fabrics and reminisce with me. Anyway, maybe this project will get me back to some sort of semi-regular sewing schedule so that the cobbler’s children can again be shod.